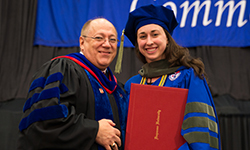 Last week, the Pennsylvania Pharmacists Association presented the 2016 Outstanding Pharmacy Student Award to Mariah Deibert, a member of the Duquesne University Mylan School of Pharmacy Class of 2016. Deibert graduated with a Pharm.D. and a concentration certificate in acute care at the May 21 Commencement ceremony. As a student, Deibert served as treasurer of the Duquesne University chapter of the Pennsylvania Pharmacists Association and attended Legislative Day at the Capitol with fellow Mylan School of Pharmacy students in 2013, 2014 and 2015. A native of Clarks Summit in northeastern Pennsylvania, Deibert actively participated in several pharmacy student organizations, serving as president, treasurer and co-chair of the recruitment committee for the Lambda Kappa Sigma Professional Fraternity for Women and participated in the American Pharmacists Association and the Professional Fraternity Council. Deibert also presented a research paper at the American Society of Health-System Pharmacists' Mid-Year Meeting.